Listen. I hate chicken breast. In my mind, if I were in school and teachers wanted to give me a punishment to force me to reconsider my life choices, sitting me in front of a plate of chicken breast would, without a doubt, do the trick. But, that’s not to say that I don’t understand why its necessary. I do! Chicken breast is among the leanest cuts of animal, giving you enough protein by the ounce to build all the muscle you need and keep you satiated for longer. That doesn’t change the fact that, when cooked wrong, it tastes like straight up cardboard. I, however, have a plan. 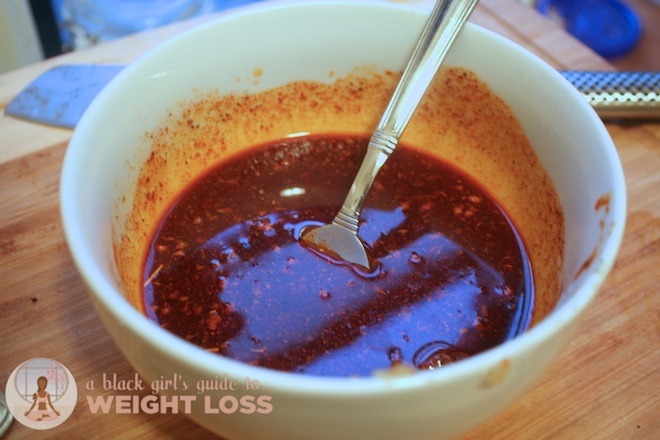 I am the grand dada diva bawse lady CEO of… spice pastes! 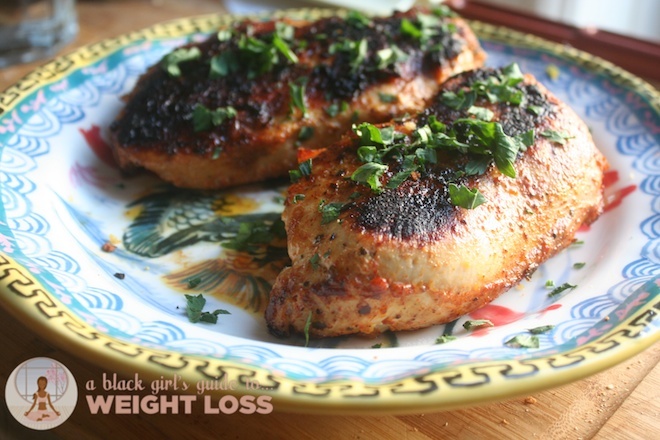 A good spice rub will transform the average abysmal chicken breast into something worth calling ya mama about. No, really… call her. Call her, and then tell her to check out this blog post. Because she needs to get on this train, too. Spice pastes are considerably easy to make — that is, if you have the spices on hand. Having a bountiful spice cabinet is important, here. 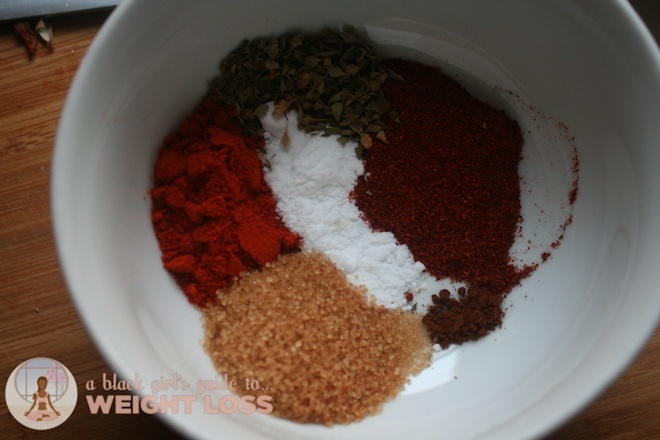 It’s the lifeblood of a clean eating kitchen, and the right combination of quality spices can transform your cooking beyond what you originally imagined. I mean, because… really. 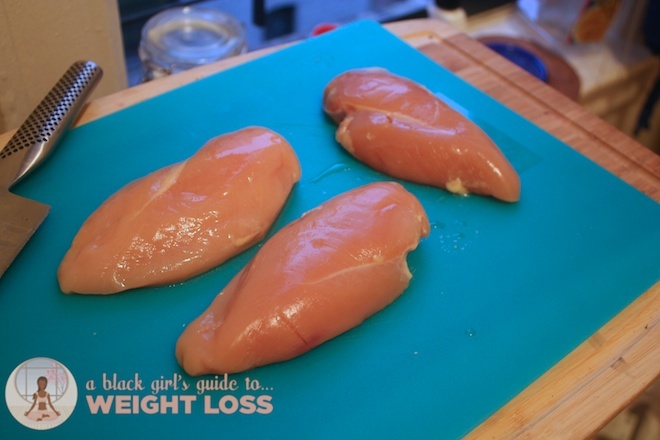 We’re about to transform this here chicken breast into something mind-blowing. When I make spice pastes, I only have a few rules: 1) stick to spice combinations that are traditionally found in cultural foods together, 2) use sugar if you must, but use it mindfully, and 3) oil is a must. Do not try to skip all the oil and only use water. Water – and, by extension, stock – can still result in dry chicken and, because of the way the oil is used in the recipe, wouldn’t produce the same benefit. I mean, by all means, try it. But… just know that it’s not my thing. My recipe for this particular spice paste is actually pretty simple: two tablespoons of ancho chile powder, two tablespoons of paprika, one tablespoon (no more than two) of dark brown sugar, 1 tablespoon of salt (more on that, later), 2 teaspoons of dried oregano, a pinch of ground cinnamon, and a fourth of a cup of organic canola oil, mixed with a fourth of a cup of chicken stock (water will also do just fine, here.) This should be enough for at least two pounds of meat, definitely no more than three. When working with poultry, your best bet is to always have a separate cutting board in order to preserve your other kitchen surfaces in regards to salmonella and other food-borne illnesses. Sure, upgrading the quality of your protein can make a difference in the risk, but that risk will never be fully erased, nor should we expect it to. Besides, since I use mainly wooden surfaces in my kitchen, I wouldn’t want raw meat juices seeping down into my wooden boards. No thanks! Now, what you do from here, is up to you. Since I was doing all of my cooking at once, I spooned my paste over both sides of my chicken on the cutting board prior to putting it in the skillet. There are tips for overnight cooking below. Cooking chicken breasts is a science. You cannot have the heat on too high, and you cannot leave it on for too long, lest you be left with hockey pucks. 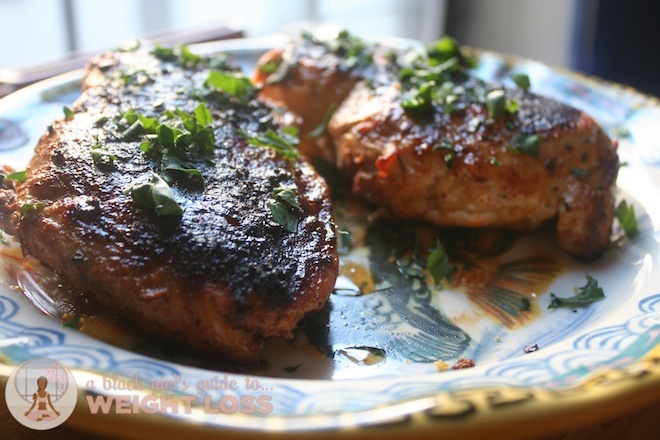 It is especially dire in the case of cooking chicken breasts, because the cut is so lean – practically 0% fat, sometimes – that there’s little leeway for success. Leaving the kitchen, here, is a dangerous proposition. 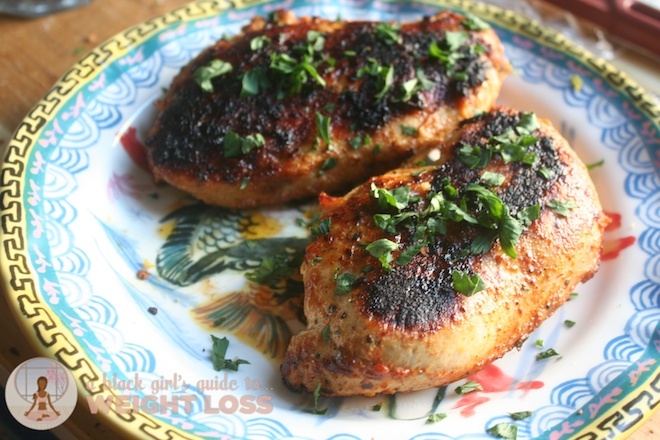 I turn my skillet on medium-low heat – maybe a 4 out of 10 – and I wait until a drop of water would sizzle on the pan before I load up my chicken breasts. Your meat should never crowd your pan – never have pieces of meat touching in your skillet. The oil in the spice paste will give you a nice crisp outside, while the slow cooking and low temperature will cook the inside without hockey-puckifying it. The sugar in the paste will add flavor, sure, but it’ll also caramelize the outside of the breast, too. If you’re worried about ensuring the doneness of your chicken breast, a meat thermometer is your best bet – not just cooking your meat well past the point of doneness. I use my meat thermometer for both meats and breads, and many other things that I need to know the temperature of prior to pulling them out of the fire. If you’re wondering about the blackness on the outer skin, don’t – that’s a combination of the caramelization of the breasts from the sugar, and the direct heating of the spices in the skillet. I’ve always left mine on a little longer just because it gives it a bit of a smoky, grilled kind of taste, especially with this particular paste recipe. That might not be for everybody, though. If you’re worried about the amount of salt or oil in the paste, again, don’t – this is enough mix for over two pounds of meat, and each breast doesn’t receive anywhere near as much salt or oil as you think. Much of it drips off the meat and onto the pan, anyhow. Spice pastes aren’t much different from spice rubs – the addition of oil for the outside (because no, much of it doesn’t seep into the breast) helps with cooking the outside to a different texture from the inside. 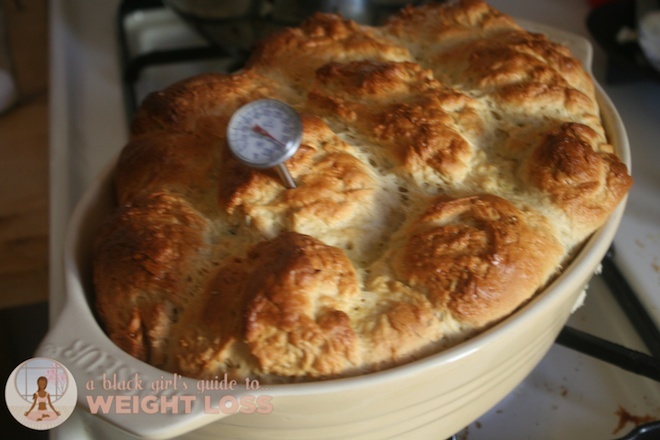 This results in juicy, moist chicken with a nice outer crust. I mean… this chicken is awesome. I have to try this soon! Once I run out of the chicken i’ve already prepped, i’m going to use this recipe in order to cut time and reduce the oil I intially used. Love, love, love. I love your writing and your body-positive, health-conscious feminism. Oh, and the food is good, too. The chicken breasts turned out right nice. The spice mix was nicely spicy and had a good flavor to boot. Not having a meat thermometer, I have another suggestion for those of us who lack such luxe accoutrement: to test for doneness, just stab it through with a knife and look for red running out. If no juice appears, or it’s clear, they’re done. Worked just fine. Cooked through (I’m still alive and no signs of food poisoning several hours later), but not hocky puckified, which is my new verd du semaine, if not de l’annee. Thanks again. Thank you. I will try this weekend. 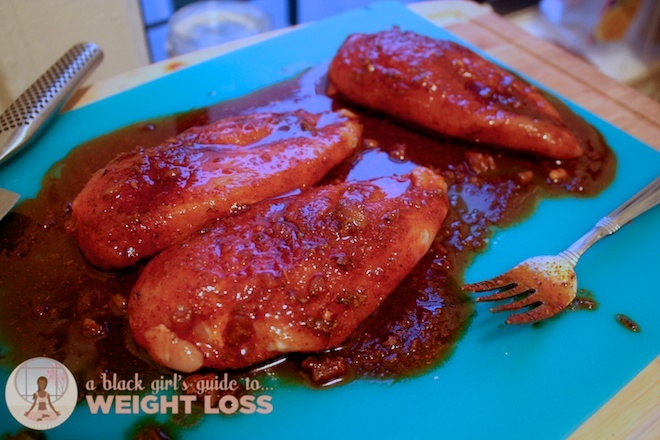 I want to so much to meal prep but my chicken always turned into rubber. Do you leave the thermometer in while cooking? Some do, but I don’t. Depends on the kind of thermometer you have. Do I have to use brown sugar? I don’t eat sugar. If you don’t, it’s an entirely different recipe. 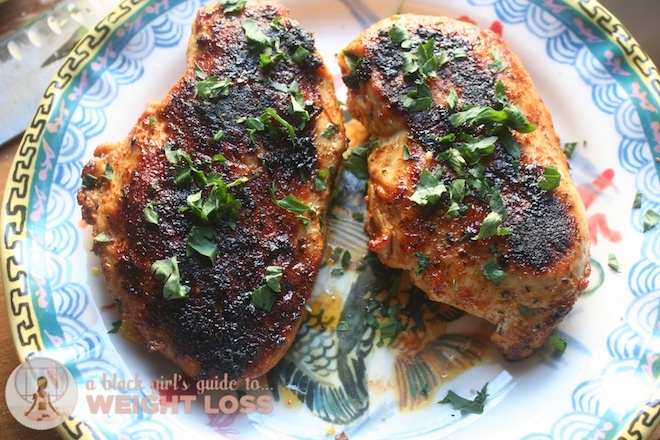 It’s basically spice rubbed chicken and could quite possibly be fine. There’s a difference between using sugar as a spice – as it was once originally intended – and “eating sugar,” by the way. So glad I found your blog. I was reading about benefits of Turmeric and there you were! How long do you cook each side? It depends on the thickness of the breast, but I’d say that 8-10 minutes is a good guess. 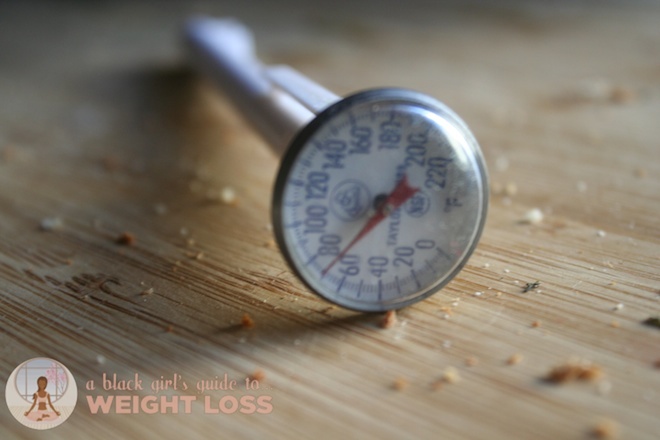 You’re better off getting a thermometer and testing out the temp of the meat while you cook. This looks amazing! Definitely adding this to my rotation!